Like puff pastry, the layered rocks looks like giant sliced strudels! 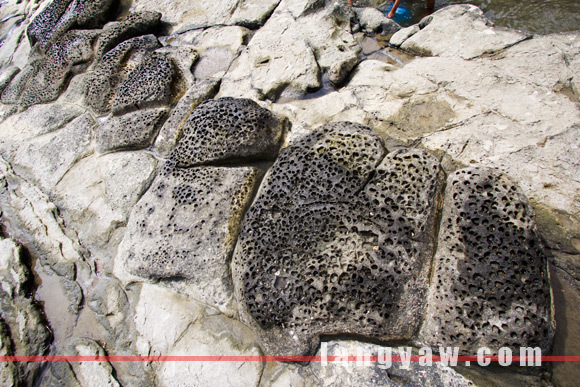 The first time I saw the waverock formation at a beach in Barangay Afga, Tangalan, Aklan, I was thinking of layers of crisp and sweet puff pastry baked into perfection. But instead of the flaky dough, these are limestone, soft rocks, which, for millenia have been shaped and molded by the forces of wind, water and continental drift to become what it is now, a beautiful rocky landscape so uncommon! There’s more to the western part of Panay than Boracay. In fact, there are many interesting places in the provinces of Aklan, Antique and western Iloilo that just amazes without driving all the way to Caticlan. Ruins, churches, food and rowdy festivals are there waiting. But wait, scanning the area, its not all layers upon layers of flat rocks. there are still other formations that just surprises: rotund and sponge but with bigger holes like that quizzes the mind on how on earth it got its form; grid like structure neatly laid out on the ground; and beautiful flowing and rounded rocks that attest to the action of seawater. Tangalan seems to be just like other municipalities along the route from Kalibo to Caticlan. But entering the municipality, one is rewarded with a sight of a simple but beautiful church, one of the oldest in the province which was built in 1889. For the adventurer, one might visit Jawili Falls, a few kilometers from the town center. However, as I lacked time during this visit, this will be for another visit. Tangalan is just 30 minutes from Kalibo. One can ride the Ceres bus from the Ceres terminal (all buses bound for Caticlan or Antique or even Iloilo via Antique) or jeepneys from the Oyo Torong Terminal. Vhires also pass this town enroute to Caticlan.